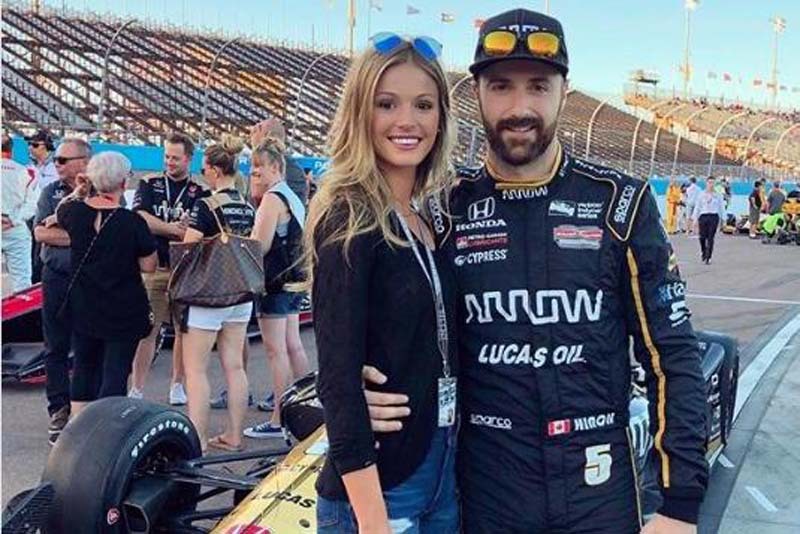 Former Dancing with the Stars contestant James Hinchcliffe is engaged. The 31-year-old IndyCar driver announced in an Instagram post Monday that he proposed to girlfriend Becky Dalton. [post_ads]Hinchcliffe shared a photo of himself and Dalton making dismayed faces for the camera. Dalton's diamond engagement ring can be seen on her left hand. "Wait, what?! I thought they said 'til DEBT do us part!' #BeckyGetsHinched," Hinchcliffe joked in the caption. Dalton, an actress known for playing Tara Russell on the Hallmark Channel series Good Witch, posted the same picture on her own account. "Just got served a life sentence #BeckyGetsHinched," she wrote. E! News said Hinchcliffe and Dalton were high school sweethearts. The couple reconnected in 2016 after Hinchcliffe was involved in a car crash during a race in Indianapolis. Hinchcliffe competed in Dancing with the Stars Season 23. He was paired with professional dancer Sharna Burgess, and finished in second place to Olympic gymnast Laurie Hernandez.